1. Add the ribs, milk, cardamom, cinnamon, cloves, bay leaf, garam masala powder, asafoetida and salt to a pan. 2. Cook on medium flame till milk dries up. 3. Remove and transfer the ribs to a large plate. 5. Heat ghee in a frying pan. 6. Combine the yogurt, red chilli powder and salt. Whisk till smooth. 7. Dip the lamb ribs in the yogurt mixture and fry till rich brown. 10. Serve hot as a snack. 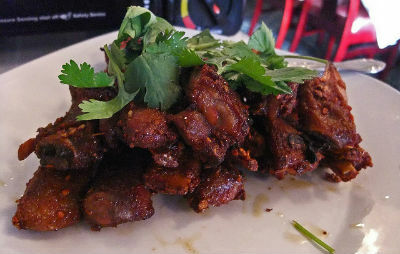 Feel free to comment or share your thoughts on this Kabargah (Fried Lamb Ribs) Recipe from Awesome Cuisine.